Boxing is a combat sport in which two people, usually wearing protective gloves, throw punches at each other for a predetermined set of time in a boxing ring. Amateur boxing is both an Olympic and Commonwealth Games sport and is a common fixture in most international games—it also has its own World Championships. Boxing is supervised by a referee over a series of one- to three-minute intervals called rounds. The result is decided when an opponent is deemed incapable to continue by a referee, is disqualified for breaking a rule, resigns by throwing in a towel, or is pronounced the winner or loser based on the judges' scorecards at the end of the contest. In the event that both fighters gain equal scores from the judges, the fight is considered a draw (professional boxing). In Olympic boxing, due to the fact that a winner must be declared, in the case of a draw - the judges use technical criteria to choose the most deserving winner of the bout. 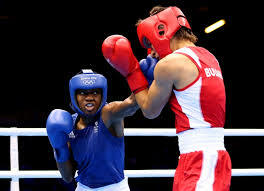 The International Amateur Boxing Association (AIBA) is the international governing body for boxing. Throughout the 17th to 19th centuries, boxing bouts were motivated by money, as the fighters competed for prize money, promoters controlled the gate, and spectators bet on the result. The modern Olympic movement revived interest in amateur sports, and amateur boxing became an Olympic sport in 1908. In their current form, Olympic and other amateur bouts are typically limited to three or four rounds, scoring is computed by points based on the number of clean blows landed, regardless of impact, and fighters wear protective headgear, reducing the number of injuries, knockdowns, and knockouts. There are two form of boxing: amateur boxing and professional. Amateur boxing: Amateur boxing may be found at the collegiate level, at the Olympic Games and Commonwealth Games, and in many other venues sanctioned by amateur boxing associations. Amateur boxing has a point scoring system that measures the number of clean blows landed rather than physical damage. Bouts consist of three rounds of three minutes in the Olympic and Commonwealth Games, and three rounds of three minutes in a national ABA (Amateur Boxing Association) bout, each with a one-minute interval between rounds. Competitors wear protective headgear and gloves with a white strip or circle across the knuckle. Professional boxing: Professional bouts are usually much longer than amateur bouts, typically ranging from ten to twelve rounds, though four-round fights are common for less experienced fighters or club fighters. There are also some two, and three-round professional bouts, especially in Australia. Headgear is not permitted in professional bouts, and boxers are generally allowed to take much more damage before a fight is halted. Weight Classes: Because Olympic boxing is a world competition, weights are listed in kilograms, using the metric system. The weight limits are crucial in Olympic boxing, because "making weight" is a key part of the competition. Boxers who fail to fall below the assigned weight before the weigh-in deadline cannot compete and are eliminated from the competition. Stance: There are two stances which a fighter can adopt. The common Orthodox stance where your left foot is your lead or the Southpaw stance which is the opposite, where your right foot is in front. Southpaws are usually left handed although this isn’t always true; it just depends on what stance the fighter feels natural with. Jab – The most important punch in boxing is the jab. It’s a punch that is thrown with the lead hand from a stance positive. It’s the weakest punch but the most effective as it allows you to set up power punches and also to keep your opponent at bay. Cross – A cross is a straight punch thrown from the back hand from a stance position. Of all the power punches, this is the most effective from a distance because it travels in a straight line which means that it’ll hit the target quicker. The ‘one two’ is a classic combination of a jab followed by a cross. Hook – The hook is a semi-circular punch that is aimed to land at your opponent’s side. It’s a punch that can generate a lot of power and increases the chance of a knock down or knock out because sometimes your opponent cannot see the punch coming (often referred to as their blindside). Uppercut – An uppercut punch rises from the bottom and is usually used when your opponent puts their head too low or in front of their lead foot. It’s also a risky punch because if you miss, you’ll be off balance and leave yourself open to counter punches. Overhand – The overhand is a punch thrown with your back hand and travels over your head in a looping fashion. It’s a wide and dangerous punch that requires good timing to land because it’s easier to see this punch coming from a distance. Defending: There are several basic maneuvers a boxer can use in order to evade or block punches. Clinching / Holding – This form of defensive is not pretty to watch, but at times is necessary, especially when you’re hurt or dazed. Clinching involves getting in close to your opponent and then tie up their arms so that they can’t throw any punches. It’s a temporary defence as the referee would break up a clinch to resume fighting, but gives you precious time to recover. However, some fighters may not be hurt but would clinch as part of their strategy or style. How to qualify for Olympic Boxing: Unlike most other Olympic sports, nations cannot simply field their top competitors in boxing. The slots are limited to 250 male in 10 weight classes and 36 female in three weight classes. Because of this limitation, it is not enough to qualify for a national tournament. Boxers must also qualify at worldwide or international regional tournaments in Europe, Asia, the Americas, Africa and Oceania to earn a slot. Boxing in India: In India, the game of boxing does not command a significant fan following, which commentators often attribute to the lack of discernible international victories. However, despite its limited success at large global championships, it is a regular medal-holder at the Asian Games and Commonwealth Games. Indian Boxing Federation is the Indian national governing body for Olympic boxing and is the India's member organization of the International Amateur Boxing Association (AIBA). It is headquartered in New Delhi. Boxing academies in india: Sports academies play a huge role in developing the overall game of an athlete. They look into each and every aspect of a sportsman that helps not only improve the physical aspect of the sport, but also the mental sie of things.Parents in India are opening up to the idea of enrollling their kids to a sports coaching institute so that overall development of the child is possible. Some of these institutes are run by current and retired sportspersons who want to imbibe their knowledge of the sport to the next generation. The products of these academies have done extremely well by winning medals at major international events. Bhiwani Boxing Club: Sports Authority of India (SAI) coach and former Indian boxer Jagdish Singh has been credited with making the Bhiwani Boxing Club or “BBC”. It was established by Hawa Singh, two-time Asian games gold medallist and 11-time National champion. Bhiwani is known as Little Cuba in India as it is home to a large number of boxers. Mary Kom boxing academy: 5-time World Champion Mary Kom has set up a boxing academy in Imphal to encourage more people to take up the sport.